General workshop information can be found in the Workshop Information area. A downloadable Acrobat version is also available. This beginner doll class is quite fun and easy. The little guy can be made as pictured as a leprechaun – or use Christmas colors and he’s a Christmas Elf (both of which have pointy ears!) or make the ears rounded for a little boy doll. Red and brown fine-point fabric pens for face features. -Thread to match – grey or neutral work well for quilt piecing. Lanette says that members can make any doll they wish. 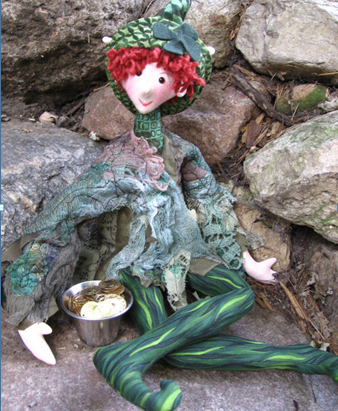 Go to vender list on the left, choose Magical threads, you will see a selection of dolls to choose from. Once you choose the doll you want to make. Please call Lanette to get a list of additional supplies you may need. You will need a pack of Doll Needles sold at most craft/fabric stores. The pattern at class will be $10. And if you want flesh colored material it is $5.00.